This reader is appropriate as a main text or a supplementary text for introductory-level survey courses in Western Civilization and European History and Civilization. 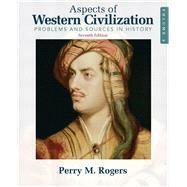 Aspects of Western Civilization:Problems and Sources in History, Volume 2, 7/e,challenges students with basic questions regarding historical development, human nature, moral action, and practical necessity. This collection of diverse primary sources explores a wide variety of issues and is organized around seven major themes: the Power Structure, Social and Spiritual Values, the Institution and the Individual, Imperialism, Revolution and Historical Transition, the Varieties of Truth, and Women in History.